In this article on 5 card Stud Rules, we will learn all about the hands and their rankings in the game. We covered an article on Five card Stud Poker rules for playing the game earlier. 5 card stud rules for hands are required for determining the winning hands and for deciding the player who ought to start betting in each round. 1. Royal Flush: Royal flush hand has A, K, Q, J and 10 of the same suit. E.g., ♠️A, ♠️K, ♠️Q, ♠️J and ♠️10. 2. Straight Flush: This has 5 cards of the same suit in a sequence. E.g., ♠️6, ♠️7, ♠️8, ♠️9, and ♠️10. 3. Four of a Kind: This hand has four out of five cards of the same rank. E.g., ♠️4, ♣️4, ♥️4, ♦️4 and ♣️10. 4. Full House: In this hand, three cards are of the same rank and the rest two cards are a pair. E.g., ♣️5, ♥️5, ♦️5, ♠️10 and♦️10. 5. Flush: Flush has five cards of the same suit. The cards are not in a sequence. E.g., ♣️2, ♣️5, ♣️10, ♣️K and ♣️A. 6. Straight: In a straight hand, all five cards are in a sequence but are not from the same suit. E.g., ♣️5, ♥️6, ♦️7, ♥️8, and ♠️9. 7. Three of a Kind: In this hand, 3 out of five cards are of the same rank. The rest two cards are not the same. E.g., ♥️7, ♦️7, ♠️7, ♥️K, and ♥️Q. 8. Two Pairs: In this hand, there are two pairs of cards. E.g., ♥️A, ♠️A, ♥️10, ♦️10, and ♦️K. 9. One Pair: This hand has only two out of 5 cards of the same rank. E.g., ♦️K ♠️K ♦️A ♥️Q ♦️J. 10: High Card: If you have none of the above hands, then your highest cards are considered. E.g. in ♦️K ♠️Q ♦️10 ♥️8 ♦️7, ♦️K is the highest card. Any hand with less than 5 cards is an incomplete hand. In 5-card stud poker, before a betting round starts, the open cards of each player are compared, so that the one with the highest hand can start betting. Therefore, knowledge of Hand ranking of incomplete hands is required to compare incomplete open hands with players to decide which player will start the round. Following situations occur in incomplete hands. In all situations, firstly, combinations of cards are compared and then the kickers (a side card that is not part of the combination) are compared. In a four-card hand, the following combinations can be made, in high to low order. In a three-card hand, the following combinations can be made, in high to low order. In this case, first a pair is considered, then the kickers are compared. In this case, the highest card is considered. E.g., if four players have ♦️K, ♠️A, ♣️K and ♣️Q, then the player with ♠️A wins. If the highest cards of two or more players are similar, then their suits are compared using the guide below. If the hands of two players are similar, then the suit of their highest cards are compared to decide the winner. Suit comparison is generally required in Stud Games to decide who will start betting in a round if the hands of two or more players are tied. 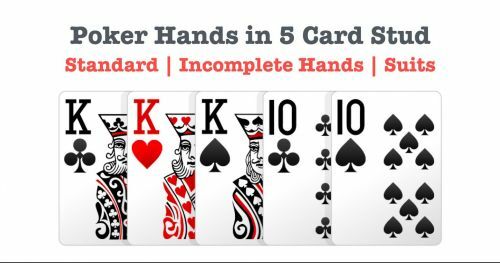 I hope you find this guide to 5-card Stud hands useful. You can read Five card Stud Poker rules and learn to play the game in a few minutes. What's the difference between Ante and Blinds?